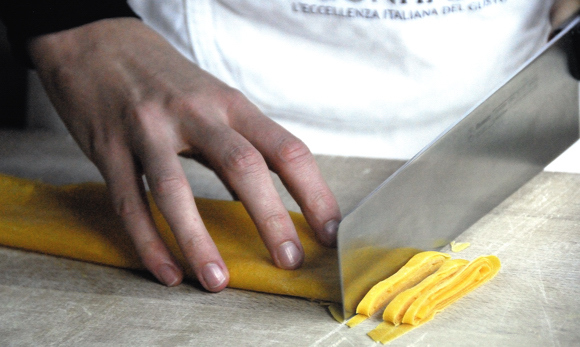 Learn how to make pasta with a pro! Set just two blocks from the Spanish Steps right in the centre of Rome, is the enthusiastic cook Fabio’s private apartment where you’ll learn Italian cooking techniques and the skills to cook delicious Italian dishes with a focus on making fresh pasta dishes. Under the guidance of your fun and friendly Italian hosts Fabio & Monica who are passionate about Italian cooking, you will immerse yourself in Italian life to discover the gastronomic delights of Rome. The aim of the course is to give you the techniques needed to cook different pasta dishes as well as one meat dish (vegetarians can be catered for) that will give you the skills to make and cook delicious fresh pasta to impress your friends back home. Before the pasta making class you will take you on a walking tour of Rome’s food shops ending up at the famous Rome outdoor food market the Campo de’ Fiori. Discover the gastronomic delights of Rome on this unique food walking tour and pasta making course that promises a culinary experience. – Meet at the meeting point in central Rome around 9.30am to start your walking tour of the local food and wine shops and the Campo de’ Fiori market before heading to Fabio’s apartment for your pasta making cooking class. Cooking classes run for around 4 hours and you’ll stay a while after cooking to sit down together to enjoy the meal you’ve learned to cook, accompanied by local wines from the region finishing about 3pm in the afternoon. €220 per person, based on double occupancy. City tax, €2, daily must be paid directly to the hotel therefore is not include in the package price.